When I was growing up, my parents were pretty much the opposite of helicopter parents. They didn’t even think about hovering. They didn’t fight our battles. They led by example – more action-oriented than verbal, I’d say – and that’s probably why I’ve always been a little fascinated when friends have told me about how their parents sat them down at family meetings and bestowed Great Words of Wisdom and Other Deep Thoughts upon their children. That just wasn’t Mama and Daddy’s style. They loved their kids and even now would do anything in the world for us, but they didn’t see motivating us as part of their job. They felt exactly zero pressure if we had a big paper or project due because they had no intention of doing work for us. Granted, they didn’t expect perfection, but by diggity they expected EFFORT. And now that I’m a mama, I totally understand where they were coming from. They didn’t see hard work and responsibility as anything that required lots of encouragement and affirmation. It’s just what you were supposed to do. As far as I know, Mama and Daddy have never written down a collection of advice for Sister, Brother, and me. I don’t think that would ever occur to them. But early this morning I was drying my hair, and out of nowhere I remembered something Mama always used to say (and probably would still say if I were at her house every day): “When you look your best, you’ll do your best.” She’s more right about that than I would’ve ever admitted when I was in high school. And over the course of the next ten minutes, I thought of a whole host of things Mama and Daddy used to say when I was younger. Apparently I was listening. And I guess I learned something, too. Here are a few little gems that came to mind. 4. You’ll always feel better about yourself if you put on a little lipstick. 5. Do your best to have a cheerful disposition. 6. The Lord never puts more on us than we can handle. 7. Your word is your bond. 8. There’s no use borrowing trouble. 9. Just put your mind to it and work at it. 10. Be a good friend. 11. If it’s worth doing, it’s worth doing well. 12. There’s just no substitute for Land O’Lakes butter. Here’s what really got me, though. As I reminisced this morning, it occurred to me that I say every single one of these things to Alex (except for the one about the lipstick, because, well, that’s not really our issue). I may communicate a little differently with him than my parents did with me, but the messages are still the same. Just yesterday, in fact, we were dealing with a situation where #7 came up over and over again, and when I heard myself ask, “Are you gonna be a man of your word?” – well, I kind of wanted to laugh. Apparently I am a real-live grown-up. Do any of y’all find yourself thinking about – or even repeating – expressions or words-o-wisdom that you heard growing up? What are some of your favorites? 1. I found the cream shirt in a pile of clean clothes on the guest room bed (what? all your clean clothes don’t hang out in the guest room? they would love it there). 2. I can’t get “Wide Awake” by Katy Perry out of my head. 3. “I wish I knew then / What I know now / Wouldn’t dive in / Wouldn’t bow down…” – SOMEBODY PLEASE MAKE IT STOP. 4. The book signing at Social in Memphis was so fun. I got to see some of my relatives, some of David’s relatives, some college friends (hey Marian, Ginny, and Bubba!) – and I had the best time talking to new friends, too. It was a delightful afternoon. 5. Travis stopped by on his way to pick up some friends at the Memphis airport, and he was in the store all of 30 seconds before someone (hey Sherrie Lynn!) asked him to sign my book. It made me so happy. 6. After the book signing, we picked up my favorite BBQ in the world for supper. And the Lord was well pleased. My sister-in-law Janie and I must have talked about how good it was for fifteen straight minutes. That Corky’s BBQ sauce is the best. 8. He wasn’t finished being honest, either. When Ole Miss kicked the final field goal and won the game, A. ran into the den screaming, “NOOOOOOO!!!! NOOOOOOO!!!! HOW COULD THIS HAPPEN?? ?” And I got so tickled because I don’t have any idea where he learned to react like that. IT IS A MYSTERY. 9. Once we said good-bye to our Memphis people, we hit the road and decided to stop in Tupelo to see Emma Kate and her family. Oh my word we enjoyed it. I got to spend about three hours in the orange chairs, aka the most relaxing place on earth. A. left with EK’s husband and the twins to go tend to a tractor (something about a tractor and a trailer and some bad tires), so EK and I sat in those chairs and talked ourselves silly. “Mama, that’s not a very good answer,” he laughed. 10. The sky was just a wonder all weekend long. And the weekend was a good’un all the way around. Earlier today I was fixing some lunch for Alex and his cousin, Joseph, and after I put their hot dogs on their paper plates (oh, we are fancy), I asked them what kind of chips they’d like on the side (again, FANCY). They both responded with the same choice, and much to my surprise, their answers prompted all manner of chips-related discussion. See, I’ve been through my fair share of potato chip phases in my life. There have been times when there was nothing better than a Pringle – only to switch allegiances a few months later and cross over into the kettle-cooked camp. When I lived in Louisiana I was certain that Zapp’s Cajun Crawtators were the best (and certainly they are still high on my list), but after we settled in Alabama, I decided that Golden Flake Dill Pickle chips were my all-time favorite. Pregnancy did nothing to change my opinion. Over the last few years I’ve dabbled in several of the strange and flavorful potato chip brands that our little neighborhood grocery store carries, and while I’ve enjoyed them, they’re not always the kinds of chips that you keep around to pack in your kids’ lunches. I’m still a sucker for a really good vinegar and salt chip, but if I’m going to enjoy a potato chip treat (and they really are a treat for me – I typically try to stay away from any sort of regular potato chip intake because I find them moderately to severely addictive), there’s one chip that’s been steady and true since I was about 15 years old. Ruffles Cheddar & Sour Cream. We determined during today’s lunch discussion that it’s my all-time favorite. It’s also the variety that Alex and Joseph picked to accompany their hot dogs, so clearly the cheddar and sour cream preference runs deep in our DNA. So what about y’all? What’s your favorite kind of potato chips? If it’s too difficult to pick just one, I totally understand. So please know that mentioning your potato chip runners-up is not only acceptable – it’s encouraged. So. A couple of months ago I drove way out in the country to record the audio for my book trailer. I mean, I didn’t drive out there because I wanted to stand in the middle of the woods and use my phone to capture the sounds of rare birds – though that would’ve certainly been kicky and fun – but it just so happened that I had an appointment with a local sound engineer who lives in a remote-ish area, hence the “way out in the country” part of the story. The folks at Tyndale had set up the whole thing, which was so great of them to do because, well, some of y’all have heard what happens on the rare occasions when Melanie and I try to podcast. 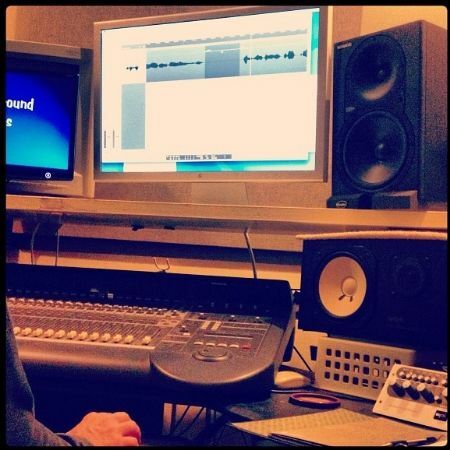 It is no secret that I am none too gifted in the recording arts. So yes, oh have mercy yes, CALL IN THE PROFESSIONALS. Anyway, the very kind sound engineer has a studio in his basement, and after we enjoyed several minutes of fairly stilted conversation about my book (it wasn’t him; it was me – because apparently I will never be able to talk about this book without turning into a case study for all the many facets of awkward human behavior), I put on some headphones and stood next to a really big microphone and resisted the urge to lean over and say, “Check, check, 1-2, check” just like the singers on TV do. I also may have contemplated what it would be like to play a guitar and sing a few bars of an old George Jones song. Fortunately, though, I didn’t sing. I just read the script. And when the nice sound engineer called me into another room where he was working on a bunch of fancy-looking equipment, we listened to what I’d recorded while I shifted in my chair and also cringed at the sound of my voice. We had to re-record one little section because I had unintentionally said the word “God” like “Ga-ad,” but even still it didn’t take more than five minutes for me to read through the script a couple of times. Afterwards, though, there was a whole lot of tweaking. Adjusting. Checking sound levels. Etc. And I probably would have been totally fascinated by all of that (I get such a kick out of watching people do the things that they love to do) if listening to the sound of my own voice OVER AND OVER AND OVER AGAIN hadn’t been a part of the audio equation. Nonetheless, this was my view for the better part of an hour. In that hour, I thought about all the people whose voices I would like to have instead of my own. Unfortunately, I was and continue to be stuck with my own voice. In all my Ellie Mae glory. Once all the editing stuff was finished, I didn’t have anything else to do with creating the video other than providing five or six family pictures. You’re gonna be really grateful for that, I think, when the circa-1971 picture of Martha and Sissie pops up on the screen because OH, THE HAIRDOS. And as you will see, I was very enamored of the side ponytail when I was in 4th grade. The pictures are by no means a reflection of my whole family, but since the book mostly focuses on my experiences with family members who are a generation or two ahead of me, the pictures follow suit. And oh my goodness that picture of Alex with Sissie makes me want to scatter glitter and rainbows as far as the eye can see. They were always so delighted with each other. So all that to say: here’s the book trailer. The concept, the execution, every bit of that stuff came from Tyndale – and I am mighty grateful. And judging from the sound of things, I am also a little bit of a Clampett. I hope you don’t require subtitles. There you have it. We must never speak of this again. Unless we speak of Martha’s hair in that first picture. Because seriously. THAT IS SOMETHING ELSE. This past Saturday morning I went to Panera so that I could try to get some writing done. Please make note of the phrase “try to” – because what I didn’t know at the time was that there was a huge soccer tournament in Birmingham this past weekend, and starting about 11:00, one soccer team after another filed into Panera for lunch. I was at a table in a little alcove by the cash registers, and at one point I counted 22 other people who were attempting to share that little alcove with me. Some were sitting, some were standing, some were crouching next to tables, and while everyone was very nice and well-behaved and etc., there were moments when I thought that it sure was going to be a shame when I experienced a bout of claustrophobia in the middle of a bunch of 11 year-old boys who just wanted to eat some turkey sandwiches and hang out for a little bit before their next game. WELCOME TO BIRMINGHAM, YOUNG SOCCER STARS. PLEASE DO ENJOY THIS PUBLIC DISPLAY OF MY CRAZY. When I got home later that afternoon, I cooked supper, visited with my people – and while the little man read what I’d written earlier in the day (listen. that child is going to be our family historian before it’s all said and done. ), I tried to re-work the beginning of a chapter in my head. I had an idea, but I needed some input – and I thought the Twitter might be able to help. Oh my goodness. 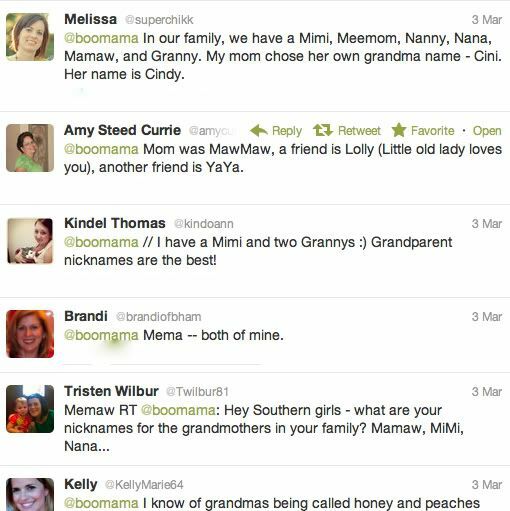 If I could, I’d carve them into some sort of Southern Mamaw Monument. They are priceless. Is that not some Granny Goodness? The nicknames made me so happy – and that’s not even half of them. Mary Lauren was one of the people who replied, and she mentioned that she’d written a post on grandmother names. 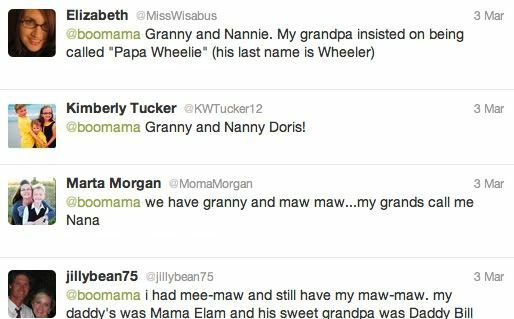 After I read it I realized that I don’t remember any grandmothers who went by “Grandma” when I was growing up. 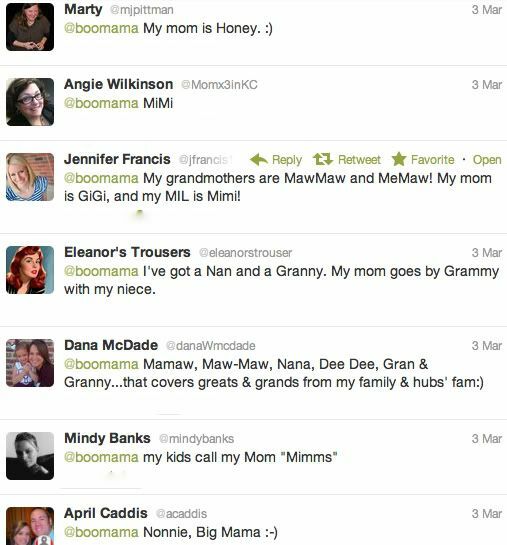 There was the occasional “Grandmother,” but mostly I knew MiMis and Mamies and GaGas and MeMaws. I’d never thought about it until the Twitter helped me out. So what about y’all? 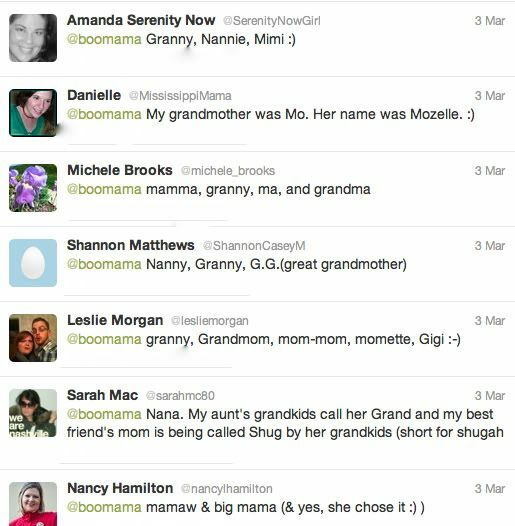 What did you call your grandmothers? 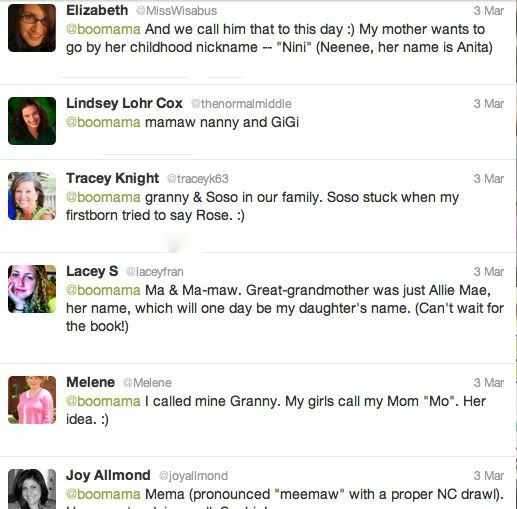 And better yet, if you’re a grandmother, what do your grandbabies call you? By the way, I’m hoping that I’ll get to be Shug or Honey one day. Which means that’s exactly what I’ll be. 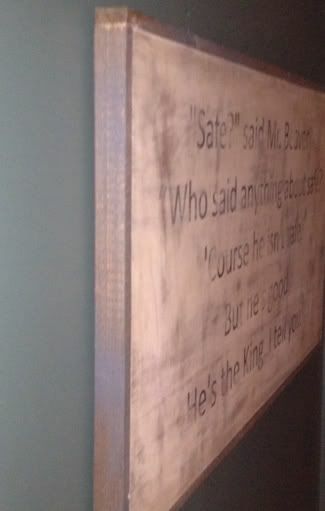 A little over a month ago I was reading Paige’s blog when I saw a picture of a custom sign that a couple from Athens, Georgia made for her kitchen. 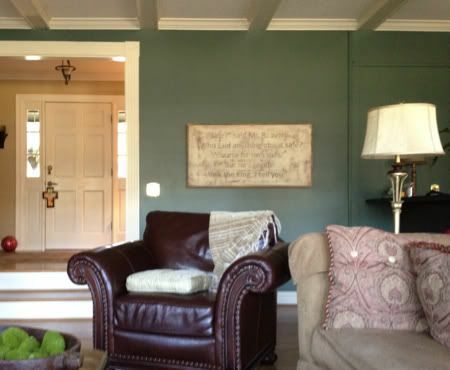 Paige had the sign personalized with one of her favorite quotes, and as I read Paige’s post and pondered the wonderfulness of that big ole wooden sign (it’s 4 ft. by 2 ft. – BIG), a thought began to crystallize in my mind: OH. I’VE GOT TO GET ME ONE OF THOSE. I thought long and hard about that sign for the rest of the day. 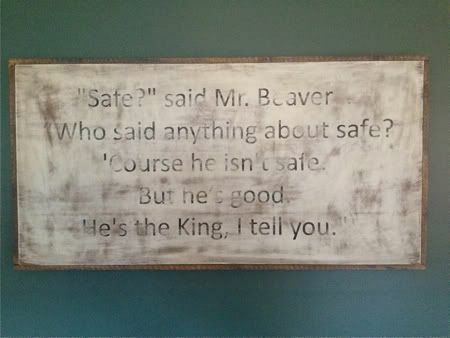 I really loved the idea of using a quote that’s special to our family. Plus, the last six months have been sort of a crazy adventure in more ways than one, so I figured that if the sign also served as a sweet reminder of this particular time of our lives, then all the better. I had the best time thinking of quotes and/or verses that might be fun to use. Once I narrowed down the list, a quote from Peace Like A River was the early frontrunner, but then I remembered that when Alex and I read The Lion, The Witch, and The Wardrobe a couple of years ago, there was one section particular that left me so choked up that I could barely read. 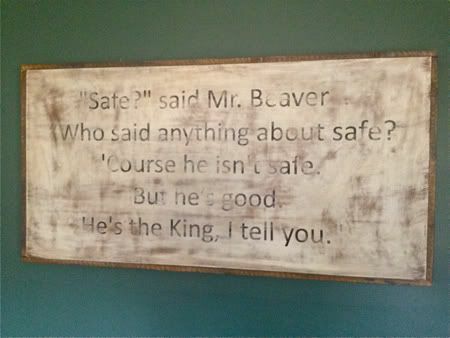 And when I remembered that quote? I ordered our little family a sign. Oh yes ma’am I did. Last Monday I walked in our front door after my night-o-writing at a hotel, and I was tickled – TICKLED, I tell you – to see a very big cardboard box in our foyer. Alex and I opened it, and y’all, I really could have cried. I love our sign so much. And my hope is that the sign will be passed down in our family for many generations to come. And now, if you sit on one of our sofas and look in the direction of the front door, this is what you see. Oh my goodness it made me smile. If you’d like pricing and shipping information about a sign of your own, email Andy and Tara at andrewshanelowry@gmail.com. 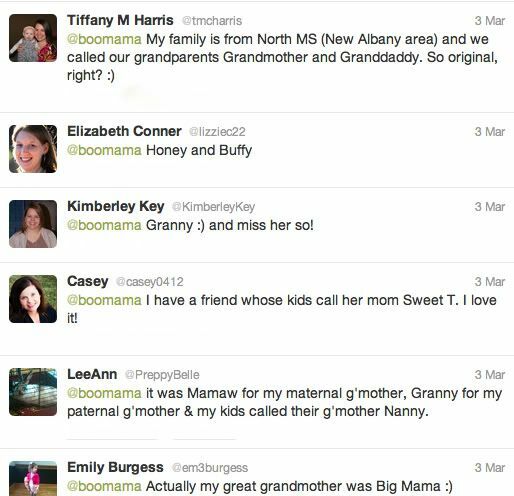 If you mention BOOMAMA in the subject line of your email, they’ll give you 10% off your order during the month of March. That’s mighty sweet of them, I think. 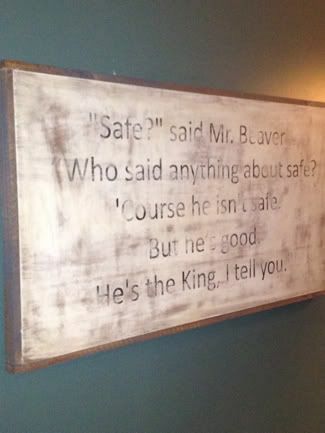 And I speak from experience when I say that your sign will bless your heart every single time you pass it in your den or hallway or kitchen or wherever. We are crazy about our sign, and you will be crazy about yours, too. Let me know if you decide to order one!